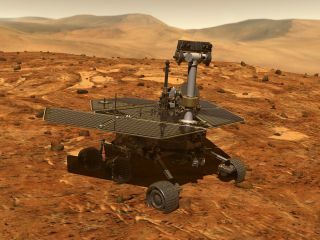 Artist's illustration of NASA's Opportunity rover on the surface of Mars. The clock hasn't run out on NASA's Opportunity Mars rover after all. On Sept. 11, NASA began a 45-day "active listening" campaign in an attempt to rouse the solar-powered Opportunity, which went silent on June 10 after a raging dust storm plunged its environs into darkness. "After a review of the progress of the listening campaign, NASA will continue its current strategy for attempting to make contact with the Opportunity rover for the foreseeable future," NASA officials wrote in a mission update yesterday (Oct. 29). "Winds could increase in the next few months at Opportunity's location on Mars, resulting in dust being blown off the rover's solar panels," they added. "The agency will reassess the situation in the January 2019 time frame." The change in strategy comes in the commitment to keep pinging Opportunity. Mission team members and NASA officials had previously said they would continue to listen for any signal from the rover at least through January. Opportunity landed on Mars in January 2004, a few weeks after its twin, Spirit. Both robots roamed around different parts of the Red Planet, looking for signs of past water activity — and finding lots of such evidence. Spirit and Opportunity's prime missions were pegged to last just three months, but the duo continued exploring Mars for years. Spirit last communicated with its handlers in 2010 and was declared dead a year later. Opportunity had been going strong, roving along the rim of the 14-mile-wide (22 kilometers) Endeavour Crater, until the dust storm hit this summer. That storm grew to encircle the entire planet by June 20. But it began dying down about a month later, and the dust had cleared so much by Sept. 11 that mission managers thought Opportunity might be getting enough sunlight to recharge its batteries. So the active listening campaign began. Opportunity has been through quite an ordeal, enduring bitterly cold Martian nights without a working heater to keep its electronic innards warm. So it's possible that the venerable rover, which has covered more ground on the surface of another world than any other vehicle, has frozen to death or fallen victim to some "fault mode" from which it cannot recover. But perhaps Opportunity lives still, and is just waiting for a strong, dust-dislodging November wind followed by a wakeup call from home. We shall see.